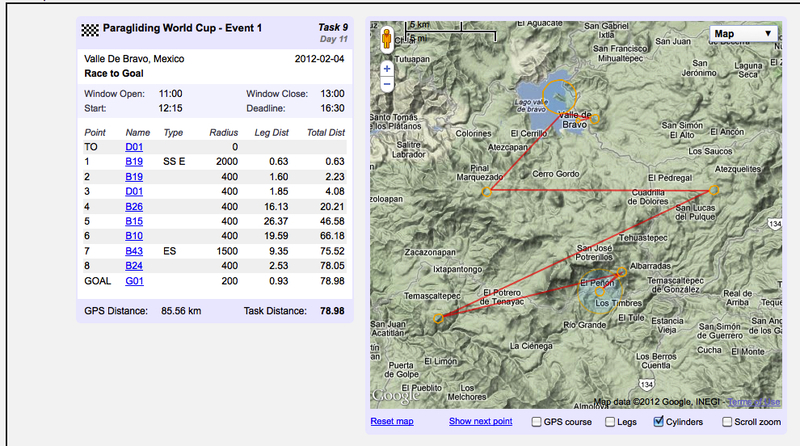 The PWC Superfinal's final task was a very fast 76 Km. task. The winners were almost 40k/hr. 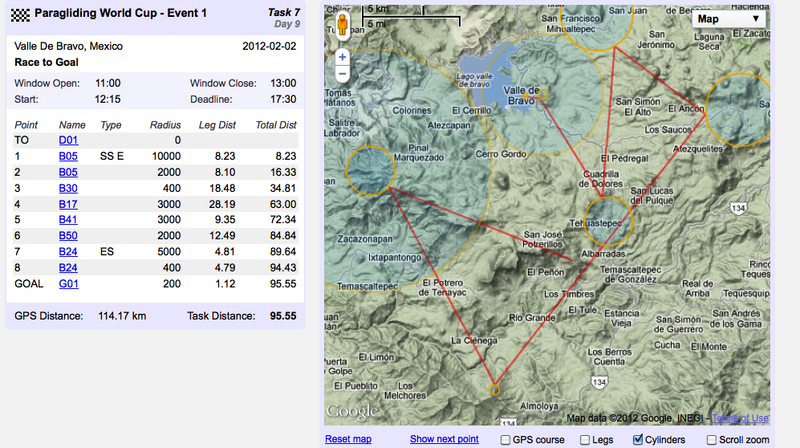 and the top-60 into goal all flew faster than 35k/hr. average speeds. Josh and Nick were running in the lead gaggle and accrued many leading points, placing 22nd and 23rd. Eric found a hole and was slower, in 49th for the day. Scores for the final task can be viewed HERE. Cumulative results are HERE. Josh maintained his hold on 5th place with Nick and Eric placing 22nd and 25th overall. BZ had some tough tasks in the last few days placing 95th and Jack sat out the last two tasks after landing under canopy on task 7. He finished up at 81st. 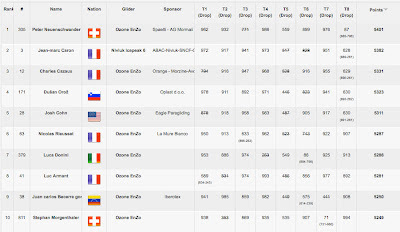 The US team placed 5th in the Nations standings - Congrats guys! And finally, Big Congratulations to Peter Neuenschwander for flying well all week! More good racing today. 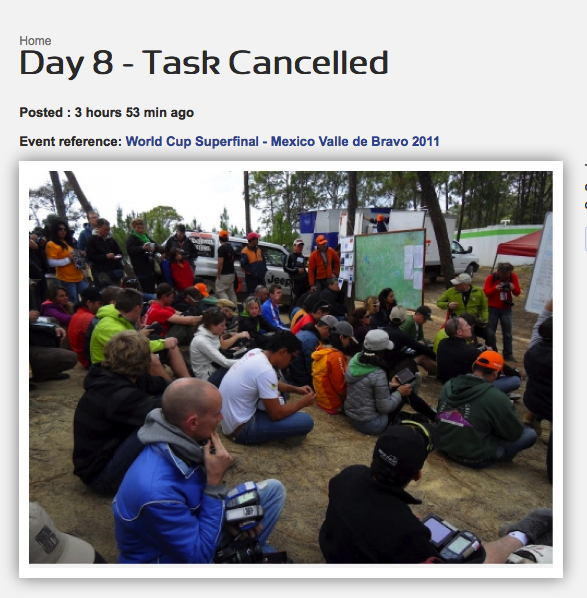 The longest task of the competition was called this morning at over 120 Km. The route tasked gave the competitors a couple of important route choice decisions that proved to be very important in the final outcome. 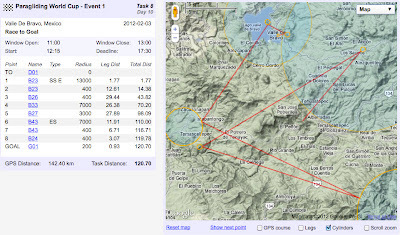 The first two turnpoints were flown very quickly, with the lead gaggles climbing to 3500 meters and then flying full bar to the next thermal triggerpoint. Between the 2nd and 4th turnpoints the field became more scattered and some pilots gambled on direct routes with varying success. It was a lot of fun to watch while the pilots flew the first couple of hours, using the LiveTrac24, but the 3D crashed a number of times. I had good luck with the 2D display though. Results are not up yet, but the Live leaderboard indicates that Ulrich Prinz was first across the line with over 75 pilots in goal. 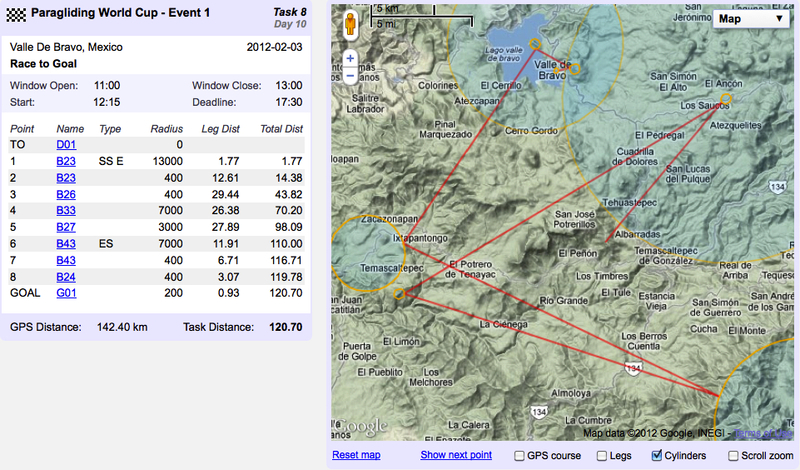 Josh, Eric and Nick all flew a great race and arrived at goal in good time. Jack, it appears, sat the day out. I hope he's uninjured and the wing is OK. Maybe he'll fly tomorrow. Valle team USA from broers philippe on Vimeo. The event has had it's share of blow-outs and reserve rides, but I'm starting to hear some good things about the new wings. Admittedly, the majority of PWC pilots still seem to vocally advocate the return of comp-class wings, but the new EN-D wings are winning over a few. The fact that you CAN experience a blow-out on bar and still fly away from the event is what we all want - and why I have taken the logic path that I have. 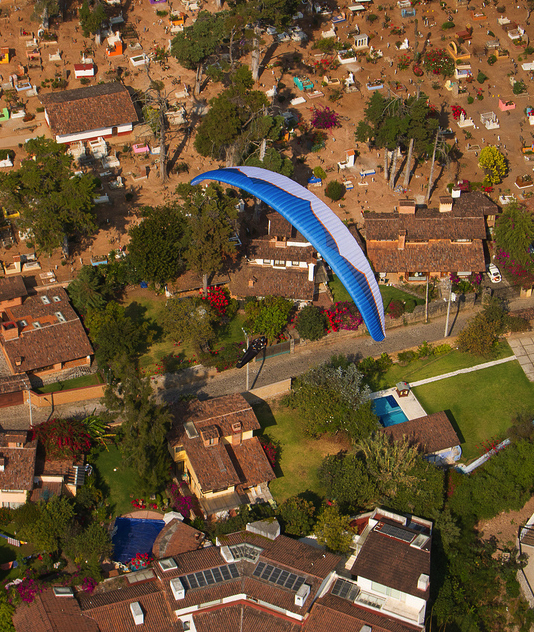 Since the era of the wonderfully honest Boom 5, the wings have demonstrated less desirable recovery characteristics - and I refuse to fly a wing that doesn't provide an opportunity to recover from an event using good technique. I'm sure Jack's event yesterday, after many 100's of solid hours on his R10.2-R-11s, hasn't endeared him to the new crop of EN-D wings. . . Me either. "OPINION: I know it's premature to celebrate the stability of this wing, but if this is the future of EN D then we can all give a huge sigh of collective relief and look forward to this new class of EN D wing. I still prefer to fly my R11 in competition, but if the lunacy of FAI/CIVL bureaucratic bumbling continues and the IP6 proves to be as benign as I am thinking it is, then everyone will benefit. I would only hold my breath a little longer while we wait for the SIV junkies to test the stall recovery, but this glider is starting to shape up as superior to old school EN D kit in every aspect worth a mention including safety. 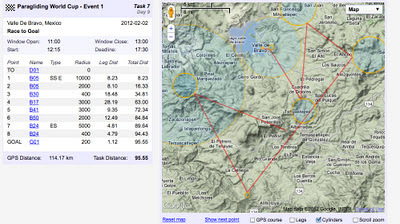 For those of you who think I'm full of BS consider that I flew the Peak 2 in similar race conditions a month ago in Porterville with the same willful disdain pushing the speed bar in anger all day whilst hanging onto the B/C lines through the turbulence and I took MANY MORE HITS on that wing." Today's weather was an improvement over the last two - sunshine and some good conditions. A 95 Km. task was called and many had fast runs at more that 33K/hr. average speeds. There were holes though. Some casualties were forced to land when they found unavoidable areas of shadow. There were also a couple of reserve rides and one low stall-it-a-couple-times to clear a cravatte that easily could have been an additional ride under canopy. The U.S team wasn't in the top-10 today, but Nick Greece placed 21st with 920 points, and Josh Cohn was 23rd with 917. Eric Reed was 32nd with 904. Jack had a tough day, landing with 45k covered. . . This is uncharacteristic for Jack. I suspect that he might have been the reserve at Crazy. I hope all who came down under reserve are good and able to fly tomorrow. Overall, Josh is still in 5th place, less than 100 points out of 1st. Eric is 18th and Nick is 24th. Jack fell to 41st today. Two more days of flying are available. Let's hope they are booming and safe!